Are you FIGHTING TO BRING TAPPING into your field of work, or personal life? If you've arrived on this page, you probably know that MILLIONS MORE PEOPLE could BENEFIT from EFT and TAPPING – especially those who desperately NEED RELIEF from TRAUMA, STRESS and CHRONIC ANXIETY that holds a shadow over their daily lives. Many of these people could become your clients, but they're resisting because they want SCIENTIFIC, MAINSTREAM SOLUTIONS. To put it bluntly, THEY DISMISS EFT AS UNSCIENTIFIC NONSENSE. Up until now, you had few options to take the dreaded woo-woo factor out of the decision process.You could spend a few decades of your life studying science.You could share copies of boring, hard-to-read research articles.You could share links to light-hearted YouTube videos. NOW YOU CAN GET A VIDEO PACKAGE THAT IS DESIGNED TO DO THE HEAVY LIFTING FOR YOU...so you'll have the opportunity to HELP CLIENTS HEAL without fighting off the dreaded woo-woo factor. Now you CAN PERSUADE even the most SKEPTICAL AUDIENCE to tap along with you! This one-of-a-kind video package combines HARD-CORE SCIENCE with an ENGAGING PRESENTATION intended to melt resistance and command attention. They'll be open to signing up for the magic ... but only after you show them the science - & we've done that for you, watch a sample trailer below! Order The Science of Tapping Package NOW! ...You can break the major resistance people have to trying EFT: the belief that it's a "woo-woo, non- scientific method used by a few people on the fringe" and show that the technique has been endorsed by experts recognized outside the EFT world and delivered results that have been reported in mainstream research journals. What would be the most effective way to use these videos to spread the word about EFT and Tapping to be more accepted and is it available in multiple languages? Is the Science of Tapping research based? Has the research behind tapping helped to bring it into clinical and academic institutions? The wisdom of these experts can convince your audience not just because of what they say – but because they present in a matter-of-face, professional style. They're not sales people. They'll remind your audience of college professors and other knowledge-based authorities. ...scientific yet accessible, sound, and convincing. It speaks for itself and I can't wait to distribute it to everyone I know! Manon Sookocheff, Ph.D.
You'll have the ideal video ready whether you're a keynote speaker, presenting to a university class, participating in a professional conference, or sharing information 1:1 with a new client. One 13 minute film designed to explain the science and research that lies at the heart of how tapping works and it explores the research that has been published regarding it's application for a variety of conditions. Use this video in short presentations, time-sensitive educational settings and 1:1 consultations with individual clients and their families. One 30 minute film exploring the mind body connection of tapping. Includes material covered in the 13-minute video but with more depth and additional stories. Use this video for conference presentations when you have more time and as an introduction to classroom lectures. Over two hours of videos presenting individual interviews with our experts. Your audience will find these stories entertaining as well as insightful and the examples are truly memorable. These videos are intended to resonate particularly well with audiences bringing medical, psychotherapeutic or an energy healing background to the viewing...allowing you to choose which expert might resonate best with your audience. BONUS: We're excited to bring this brand-new video series to you! 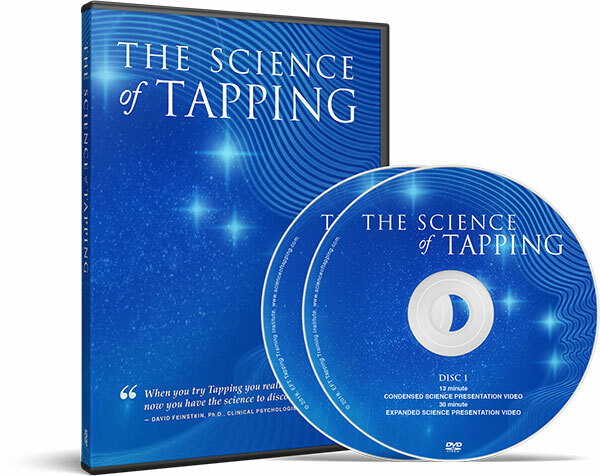 For a limited time, when you purchase the package you will also get an up to date 30-page Tapping Research Summary called "The Current State of Scientific Evidence for Tapping." Use this report to gain more confidence and have a resource to offer that is up to date, organized for ease of use and professionally created to impress your audience. Gain more background and explain Tapping even more clearly to your target audience. Our Charter Subscription Membership Plan will provide you with all of our video content, access to our research reports and updates, plus a link to learn and share the science behind this remarkable therapeutic tool with your peers!